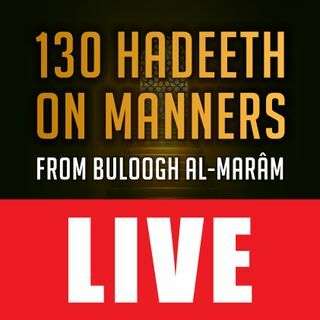 Moosaa Richardson continues his reading of Shaykh Saalih al-Fowzaan's explanation of the chapters on manners from the book, Buloogh al-Maraam. This class is a focused study of Hadeeth #32, a warning against materialism. which can enslave a person and become his actual religion! These lessons are a study of the book, Buloogh al-Maraam, by al-Haafith Ibn Hajar (may Allaah have Mercy on him). The explanation of Shaykh Saalih al-Fowzaan (may Allaah preserve him), Et-haaf al-Keraam, is read ... See More word-for-word, in Arabic, and translated into clear English. This 27th lesson was recorded on 1440.07.17, broadcast live, and then edited and republished for free downloading. Jazaak Allaahu khayran 'Abd al-RaHmaan! May Allaah bless you for your kind words of encouragement & du'aa. I just wanna use this space to offer my thanks for these beneficial audios you guys consistently upload. May Allaah bless you , your community and protect u all. We apologize for the technical difficulties last night with our live broadcast. The complete audio has been uploaded.